Psalm 23:1-3 1 The Lord is my shepherd, I shall not want. 2 He makes me lie down in green pastures; he leads me beside still waters; 3 he restores my soul. *He leads me in right paths for his name’s sake. why, in His wisdom, He hath lead me so. As I read the familiar lines I remembered I don’t have to understand the why of things. I don’t have to carry the burdens of the world on my shoulders. I don’t even have try to carry all of the world’s problems. I can’t change the way people treat others, I have no control over how one person treats another. However, I do have control over how I treat those around me. I do have control of how I respond to the many crises trumpeted in the news. My grandfather’s poem reminds me that life is not a bed or roses where everything will always be “hot coco, and peanut butter toast by the evening fire.” No there are bad people in the world and even though I, or my loved ones, have done nothing wrong, or done anything to cause a tragedy, other people will affect my life in both good ways and bad. I can’t stop it from happening. I know I can’t stop the hate, but, I can stop the hate from residing in my heart. I can stop myself from acting out of anger and rage. I can stop and take a deep breath and let the real me come up from deep inside. That is all I can do. For the prayer practice this week I am offering a chant that helps me when I am feeling lost. It is the refrain of a hymn written by Marty Haugen and below is the score for the chant. 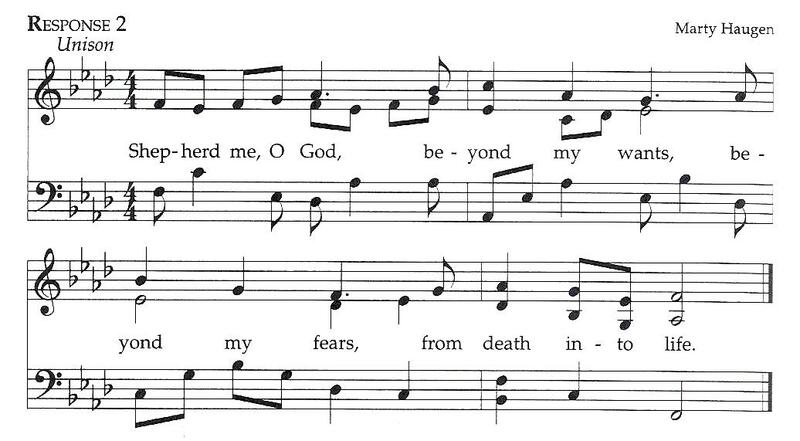 Above is a video of Haugen’s complete hymn. Watch the above video and when you are feeling a little lost this week sing the refrain. You don’t have to chant out loud, and you can chant anytime of the day, driving, riding public transit, cooking dinner or even working on that paper for class or the boss. May you find your still point, and may it bring you comfort.